Each morning when I open my email, I’m surprised to see so many of you who read my blog and email me with comments and questions. There are more people who ‘lurk’ instead---and that’s okay. When I first started this blog, I never got a comment and never received an email from people who read my posts. Sometimes, I open up my mail, to find thirty to fifty emails waiting to be opened from loyal readers. These people are usually the 'lurkers' who do not comment. Different questions or comments can range from various topics. Some ask me about my ‘mental disorders’ and if they are real, some ask me about my lesbian lifestyle and if I have ever been with a man, others ask me about my family life and upbringing. Most ask me, “Is this all true?” The answer is, yes. Each post is disgustingly all truth. Sometimes I even have to ask my family members, “Is this okay to post?” I have other people asking, “Why do you display your life out on the net?” To me, my life is a comedy. I always told my family, if I ever got a deal where someone would want to make my life into a movie, I would go for it right away. I mean, the irony of being raised in an Italian family in New York that consists of organized crime, drinking problems, mental illnesses and the youngest daughter (me) being a lesbian—it has to be a comedy. If I can’t laugh at myself, I’m going to be one miserable person. I’m sure my beautiful sisters would be worried about ‘who’ would be playing their characters. Women can be so catty. I’m all for civil unions. I do believe the concept of ‘marriage’ goes back to biblical times and should be held sacred for a man and woman to create a family. I’m not saying that homosexual couples cannot have a family. Of course they can. I just feel it should be set up in a different arena. I think they should have rights as far as protecting possessions in case one partner should pass away. It’s important that the community has the same opportunities to make their commitment ‘official’ and have similar benefits as heterosexual marriages; however, we should recognize what’s being lenient, and what’s being too lenient in the matter of holy matrimony. This brings me to another topic. Gay and lesbian cults. I should better reference that to, gay and lesbian groups, who only have one opinion, for a number of 200+ people. They gather in large groups; and yet, criticize others for their lifestyle. For instance, if you’re bi-sexual, you’re an abomination to ‘their community’. I’ve seen this happen so many times. Being bi-sexual is yet—“another preference”—just as being homosexual is. I’ve found numbers of these gay communities bashing bi-sexual people---yet the gay and lesbian community want to be accepted so badly by society? Some seem so hypocritical to me. Do we have to place a gender on our love for someone? Is that the rule? If we say we’re ‘a lesbian’, does it mean that we’ll 100% no doubt, end up with a woman when we’re old and gray? There are no guarantees who we’ll end up with. Why put rules and regulations upon love? There’s another group forming in my community called, “The Orange Pride Group”. I referenced to them once before on a previous post. They hold events such as pot luck dinners, poker night, bowling night, and other miscellaneous activities. They recently just emailed me asking my partner and me to join them in a New Year’s Eve bash. The only problem with this is, I like to spend it with my straight friends as well. It seems to me like these women want nothing to do with the heterosexual world whatsoever. I understand they want to form a group that is dedicated for the rights of the gay and lesbian community, but to congregate only with your own kind seems redundant to me. It’s almost as if they’re hiding out. I feel more accepted by the heterosexual community than I do with the gay & lesbian community. I don’t fit their stipulations. I was once told that I was not a “real lesbian”. Well tell me then, what is a real lesbian? Yes, I have dated men in the past, and yes, I do wear make up and do my hair, but does this categorize me or set a permanent label on my forehead? It seems so unfair. When they ask me, if I’m a “real lesbian”, I tell them to ask my partner of twelve years. She’ll tell you. In fact, I don’t even like to be labeled. Then you have lesbians who are ‘man haters’. Oh how I despise that. I mean, think about it—how the hell did you get on this earth in the first place? As soon as a man approaches them in a bar or in another forum, they simply withdraw and give them a nasty attitude. They go on automatic defense mechanism to ward off this male specimen as a friend. To not even consider a heterosexual man as a friend??? Yet again, another prejudice—and they want to be accepted in society? If they don’t start acting like ‘humans’—no, they’ll never be accepted in society. Respect and love for all is needed, in order to get along with anyone. Do you disagree with that? Another beef I have with the lesbian community is the ‘gay advertising’. The amount of gay pride bumper stickers, rainbow rings dangling off their necks and pink triangles on their t-shirts are utterly effusive. 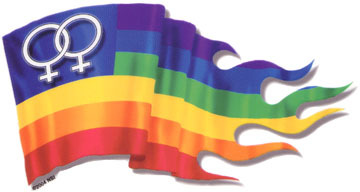 Now, here’s an interesting scenario…What if straight people walked around with t-shirts saying, “Proud to Be Straight?” If a heterosexual had a bumper sticker that read, “Straight Pride”, would that offend some gay and lesbians? Sure it would. These ‘in your face’ attitudes are what separates us. I want to thank my friend Bryan for the thought provoking question that stimulated this post for today. I also want to tell all of you how much I appreciate the feedback---even the ones who ~lurk~ and don’t comment; yet throw me an email to share your thoughts. I didn’t realize that so many of you were out there reading my blabber. Please feel free to email me anytime you have a question or concern. If I don’t respond right away, I definitely will get back to you within a couple of days. All questions and comments will be kept anonymous.